There's an irrepressible sugary charm that surrounds Legally Blonde. Late into the show's run and on a cold January night too, the Gatehouse Theatre was packed with a grinning audience picking up on the cast's infectious enthusiasm. 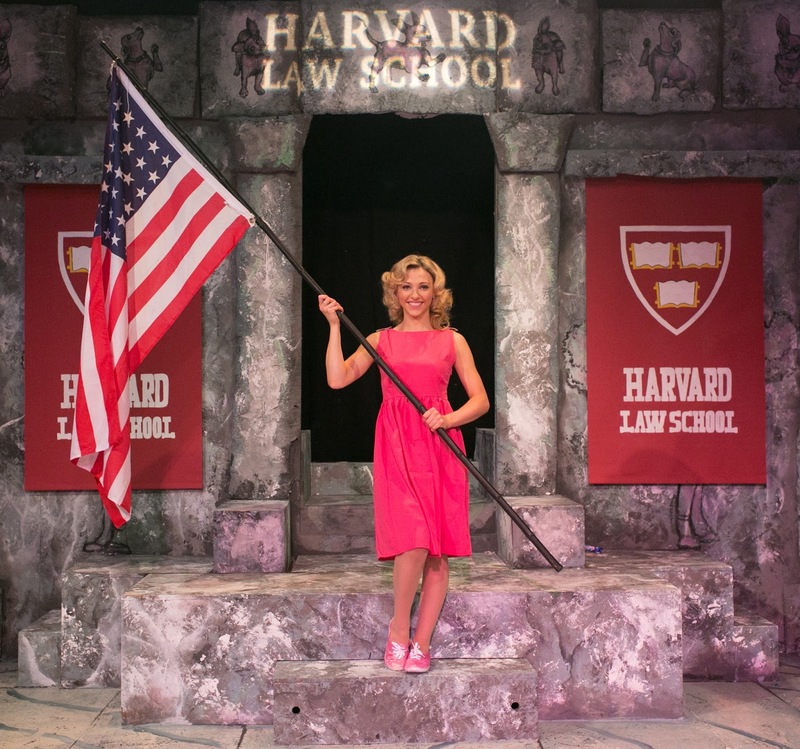 Legally Blonde's sexual politics are intriguing. With the exception of Emmett (and possibly Kyle) its underlying premise is that men are duplicitous bums. And whilst (look away - spoiler alert) Elle Woods does of course go on to achieve legal success, she doesn't achieve this recognition through a knowledge of law - but rather by applying her initiative to what are actually stereotypical female reference points: a sensitive "gaydar" and a knowledge of perms. So, does Legally Blonde actually champion female empowerment, or simply reinforce age-old tropes? Discuss. Either way, Abbie Chambers who makes her professional debut as Elle does a fabulous job in the role. It's a massive part - on stage almost throughout, Chambers never fails to convince as she journeys through heartbreak and endeavour to her ultimate happy ending. The most sympathetic character on stage is Jodie Jacobs’ hairdresser Paulette, who in a world away from Elle’s pink infused (and albeit superficial) vacuity, is actually grounded in her disappointment. Jacobs keeps Paulette adorably optimistic and able to offer the wisdom of a woman who's seen life for what it really is, in a reprise of the part that she delivered so fabulously at Kilworth House last summer. Jacobs is in a league of her own here, her voice is gorgeously powered, whilst her experience sees her to master Paulette’s wry comedy, perfectly. Robert Colvin offers a polished and three dimensional take on Warner - who really is a 2-D creation. There is an interesting and timely parallel between the fictional Warner and Grey Gardens' real-life Joseph Kennedy - both characters out to use love to further their own personal career ambitions - discarding relationships as it suits. Stepping into the role of Brooke Wyndham, Katie Bradley does a fabulous job as the energetic and entertaining fitness guru. And a nod here to Anthony Whiteman's remarkable choreography. Brooke's second half opener Whipped Into Shape is but a blur of skipping rope as her ensemble achieve a wow of a routine in the narrow confines of the Gatehouse's traverse. John Plews triumphs again. The director is at his best compacting big shows into his beloved venue, assisted here by Matt Abrams and his band who deliver an assured take on the upbeat score, whilst Isobel Power Smith's set also impresses.